When I was in high school I enjoyed reading science fiction. There is one story I read way back then that I still remember, so strong was the image left in my mind. I have forgotten the details, but it was about a scientist who found a way to transfer everything in his brain onto a computer. His body was old and soon died, but this computer kept his mind alive beyond the death of his body. The man had become a machine, with all the incredible capabilities of a computer. But machine was like a human, with the scientist’s personality, emotions, hopes, dreams, and ability to communicate with others– all of that, but no body. By adding a way to collect the necessary power from the sun, or even the stars, the scientist had found a way to keep his mind alive forever. This ‘human-computer’ was selected for a mission into outer space. The intent was for the ‘scientist’ to learn all he could while in the earth’s orbit, and then come back to earth with the results. However, something went terribly wrong, the space ship got out of its orbit, and went shooting off into the far reaches of the universe with no chance of ever returning. Before long it was out of radio contact. The image one was left with at the end of the story is the horror of this scientist who realizes that he will never again be in contact with anyone, and he is doomed to live that way forever. He did not need to fear death. But without any hope of any connection to anyone ever again, death would have been a blessing. He could not return to earth, and he would never die. He was doomed to eternal loneliness. It was that terrible image that I can still remember. C. S. Lewis once wrote a little novel in which he describes what heaven and hell might be like (The Great Divorce, 1945). Heaven is, of course, wonderful. It is beautiful, everyone gets along, the Lord God is there with his magnificent presence, and there is no death or illness or time pressure. All is wonderful, as is promised in the Bible. Lewis’s image of hell is thought provoking. First of all, just like in heaven, people will live forever. Second, there are no flames in Lewis’ imagined hell. And third, you can have anything you want in hell, and you can go wherever you want. All you have to do is wish for something, and it happens. Well, so far, so good! But the third part of the description is the clinker. There is no God in hell, so there is no goodness. Everyone is completely wicked and selfish, and so no one can get along with anyone else. They are all free to do what they want and go where they want, but they use that freedom to keep moving farther and farther apart, to get away from everyone else. They all end up angry and alone and lonely, but they can’t stand to be around each other. Without any desire to change, they become more and more miserable. The description of this self-inflicted hell is quite depressing. Even though one can live forever and do whatever you want, the reader comes to see how without good desires, hell would be a terrible place, even without the flames. In both stories, the terrifying prospect is that of life without any connections, without any relationships. Both stories, though merely imaginative fictions, call to mind a very real problem. 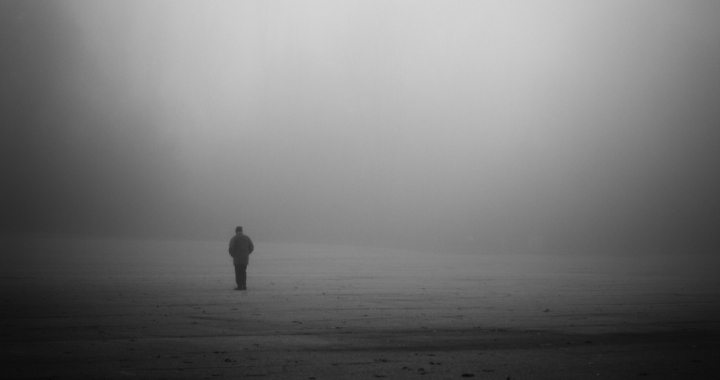 Many people are incredibly lonely, and we all, if we live long enough, face that possibility. In rural areas, there are for many people all kinds of connections– large extended families with lots of relationships, and a connection to the land, community, and churches that might go back five or six generations. But in most cities you will find thousands of people who, though surrounded by thousands of other people, are completely alone, with no connections to anyone. Or, one could go into any care center, even in rural communities, and there find people who may have at one time had many connections, but are now, becoming increasingly disconnected. Friends and immediate family members are all dead, living relatives all live a great distance away (or never visit), and the declining ability to hear, or see, or think clearly make even worse the problem of being disconnected from other people. James 4:1-…7a — What causes fights and quarrels among you? Don’t they come from your desires that battle within you? You desire but do not have, so you kill. You covet but you cannot get what you want, so you quarrel and fight. You do not have because you do not ask God. When you ask, you do not receive, because you ask with wrong motives, that you may spend what you get on your pleasures… Submit yourselves, then, to God. Psalm 88:18 — You have taken from me friend and neighbor– darkness is my closest friend. Romans 14:7-8 — For none of us lives for ourselves alone,and none of us dies for ourselves alone. If we live, we live for the Lord; and if we die, we die for the Lord. So, whether we live or die, we belong to the Lord. Turn to me and be gracious to me, O Lord, for I am lonely and afflicted. Relieve the troubles of my heart and free me from my anguish. This entry was tagged lonely. Bookmark the permalink. ← 752) What is the Purpose of the Church?